The candy cane tray is fun and look great with a peppermint stick ice cream angel food cake on top. 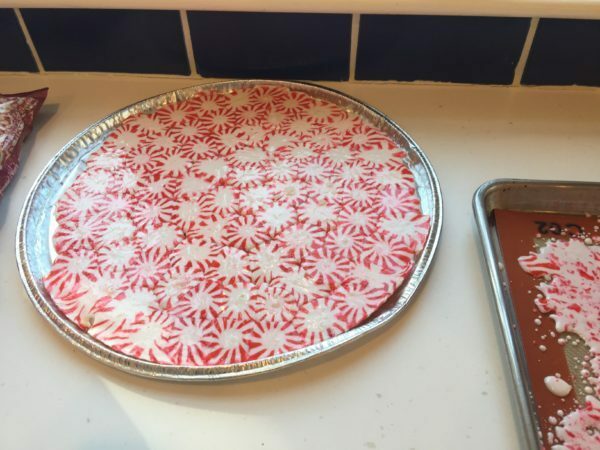 Line a cookie sheet or aluminum pizza tray with parchment paper, place round peppermint candies (cheaper the better) about ¼’ apart to cover the entire surface of the sheet. Bake until melted, 12-14 minutes. Do not let brown. Cool 5 minutes then remove and use as a tray for desserts. Hint: for best results use the inexpensive, generic brand peppermint candies that are white in the center and red and white on the outside. I used 6 bags for pizza tray.